The defending NBA Development League champion Rio Grande Valley Vipers won their franchise-record seventh-straight game by beating the Maine Red Claws 119-110 Tuesday at State Farm Arena in front of a crowd of 4,141. Up 18-15 midway through the first quarter, the Vipers (14-7) scored five-straight points on a Jeff Adrien lay-up, a three-pointer by Jerel McNeal and a dunk by Patrick Sullivan. The Red Claws (10-14) responded with an 8-0 run to pull within 25-23, capped by a DeShawn Sims lay-up. Terrel Harris ended the run by hitting a pair of free throws to give the Vipers a 27-23 lead with 2:56 remaining, sparking a 13-4 run to close the first quarter as, with time winding down, Houston Rockets-assignee Ish Smith shot a three-pointer over the out-stretched arm of Boston Celtics-assignee Avery Bradley 10 months to the day after doing so for Wake Forest against Bradley’s Texas Longhorns to win in the first round of the NCAA Tournament. Up 45-34 in the opening minutes of the second quarter, the Vipers went on a 14-0 run, on the power of three three-pointers, two by Harris and one by Shakur, to take a 59-34 lead at the 5:32 mark after an Adrien lay-up. The Red Claws opened the third quarter on a 17-6 run to pull within 75-63 at the 6:22 mark of the third quarter, but a put-back lay-up by Mouhammad Faye and a three-point play by McNeal gave the Vipers a 17-point lead. Matt Janning hit a three-pointer with seconds remaining in the third to bring the Red Claws back within 12 at 90-78. The Red Claws opened the fourth quarter on an 8-0 run to pull within 91-86. Harris gave the Vipers their first points of the quarter with his fourth three-pointer of the game. 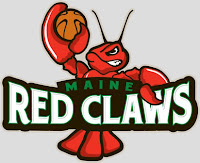 Bradley brought the Red Claws to within 98-96 after hitting a three-pointer, and after Shakur hit a lay-up, Jamar Smith drained a three-pointer to make it a one-point game at 100-99. Shakur responded on the other end with a basket that was followed by a three-point play plus a technical free throw by McNeal, a three-pointer by Faye, a three-pointer by Shakur an alley-oop from Smith to Sullivan, and another technical free throw by McNeal to make it 115-99 Vipers. This game marks the first time this season that Shakur hit more than two three-pointers in a game this season (3-for-6). He finished with 20 points, six rebounds, seven assists and four steals. Smith finished with six points, two rebounds, six assists and one steal in his Vipers debut. The Red Claws were led by Sims, who scored 21 points with 12 rebounds (four offensive). Bradley finished with 13 points, two rebounds, two assists, one steal and one block.